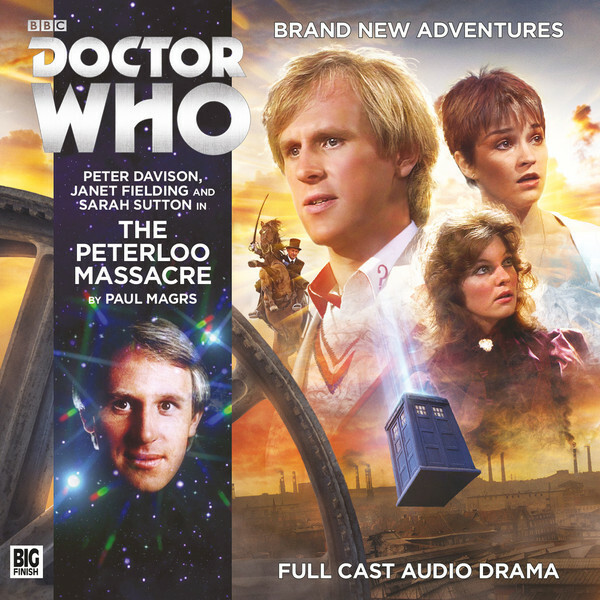 BIG Big Finish Week: Doctor Who - THE PETERLOO MASSACRE Review | Warped Factor - Words in the Key of Geek. In his last Main Range Who story for Big Finish, The Lady of Mercia in 2013, writer Paul Magrs proved one thing above all else – he gives good Tegan. With The Peterloo Massacre, he maintains his grip on her character, while also bringing the often somewhat ice-queen, good-girl Nyssa an additional dimension. When the good children snap, it’s often all the more effective because it comes out of the blue, and there’s a surge of fury behind the Trakenite’s words in the later stages of this story that on-screen we only ever guessed at once or twice – most notably in Arc of Infinity, where she turned rebel to save the Doctor’s life. There has to be something profoundly wrong and unbalanced in the universe to wring a threat from Nyssa’s lips. Welcome to The Peterloo Massacre. It’s hopefully not too much of a spoiler to tell you that this is a pure historical. As such, there’s an entirely different quality to the storytelling than you’d normally get with an alien threat story – there are, at best, only tiny victories to be wrested from the rollercoaster of established fact, and when you’re dealing with established facts as dark and bloody as those of the Peterloo Massacre, it’s actually history itself that gives you your sense of impending disaster, of growing tension. The structure is essentially like swimming towards a tidal wave, hoping to survive. Against this scale of inevitable destruction, Magrs here essentially gives us a take on JB Priestley’s haunting play, An Inspector Calls, with Mr Hurley, the industrialist, factory owner and unsympathetic grinder of the faces of the poor, his wife, the feckless would-be Lady Hurley, insisting on gentility in the face of crushing poverty all around, and their son William, who’s been ‘handed it all on a plate’ but who still joins the local militia as the family who don’t see their actions as destructive, and Cathy Roberts, their maid and would-be rabble-rouser as the cause of their catharsis. There’s a certain broadening out of their world – we see Cathy’s father, a more traditional forelock-tugger and forbidder of things, and her ‘brother,’ a young child on whom Magrs relies to bring the horror of the massacre home to the capitalists. Seen from our point in time, the Peterloo Massacre was a disgrace, an unspeakable abomination where the rich unleashed hell on the poor for the crime of a raised voice, a hungry belly, and a hope for more, and there’s always a chance, when you dabble in bringing it to an audience, that it will sound like an anti-capitalist polemic. There’s arguably some of that in Magrs’ piece, and there are certainly characters in the militia that mow down a crowd of unarmed protesters in St Peter’s Square who embody the worst of what have now come to be known as ‘the 1%.’ But if that were all that The Peterloo Massacre did, it would be a more linear, less rewarding couple of hours than in fact it is. At least through their parts in the massacre, the male Hurleys come to see a more 21st century sense than they dream exists at the start of the story, with both William and his father growing sickened at the cost, the actions, the sheer waste of the slaughter on what remains the worst and most violent day in Manchester’s history. Unreconstructed attitudes of privilege may continue unabated on all sides of them, but the events of the Peterloo Massacre will change the lives of these two men forever. Magrs is able to show us, as Priestley did before him, that when you contextualise glib economic and political arguments, when you bring them home and make them affect those close to you, it becomes less and less possible to maintain high-handed attitudes unless you actually see the poor as something entirely sub-human. It becomes impossible to advocate in favour of policies that give more to people with enough already by taking the bread out of the mouths of those who are starving – unless you make that disconnection. Peer Davison’s Fifth Doctor is probably one of the most interesting Doctors to paint into the corners of inevitability demanded by pure historical stories. Lacking the natural bombast of either of the Baker incarnations, the Fifth Doctor nevertheless stands eloquent, frequently, against injustice and suffering – his on-screen speech to the Cyberleader in Earthshock about the small beautiful moments that make life worthwhile, his declaration that he speaks treason fluently in The Awakening, these moments define the adamantine core of a Doctor less loud and showy, but not about to stand for any nonsense. Dropping that particular kind of Doctor into a situation where history itself is the enemy, where human beings and their short-sighted, self-aggrandizing goals are the only real monsters to fight, gives the Davison Doctor a little more freedom to show his willful side, and Magrs capitalizes (ahem) on that here, allowing the Doctor to tell people in advance that the event they all think will be a peaceful protest and a bit of a bloody nose for the uppity protestors respectively will in fact be carnage, catastrophe and mayhem, and allowing him to rage at them in its aftermath, while still having his Time Lord cake and walking away. In essence, it follows the great tradition of the Hartnell historicals, inasmuch as it’s the companions who go wandering off onto different sides of the inevitable conflict, and the Doctor who has to do everything he safely can to get them back together and get out of Dodge. This time though, neither Tegan nor Nyssa will let him simply do that – Tegan finds herself with William and his militia-mates, Nyssa with Cathy as she prepares to make a speech. With both his companions in the thick of things, the Doctor feels the trap door of history slamming shut over his head, and the three of them can only hold their breath as the tidal wave of inevitable violence breaks over them, and hope to survive. The events that spur Nyssa to her fury are delivered in a way that’ll break your heart with the simplicity, the honesty of it, and yet it’s Nyssa who won’t let the Doctor just skip off in his magic box, Nyssa who realises that while the grand sweep of history may be inevitable, they can still make a difference to individual lives. It’s Nyssa more than anyone here who takes the role of Priestley’s Inspector Goole, making the Hurley family confront its actions and their consequences, not only as regards Peter, Cathy Roberts’ ‘brother,’ but ‘all the other Peters’ who are, in one way or another, dependent on the choices the Hurleys make for their lives, their welfare, and the opportunity to make something useful of themselves. With history as your villain of course, there’s a degree more declamation in The Peterloo Massacre than is ever necessary when you have personified villains or monsters to roar at the microphone to up the ante, and cliff-hanging declarations like ‘This city’s about to go to war with itself’ might not be to some listeners’ tastes. But the pacing is very strong in this story, building that sense of the inevitable threat, the tidal wave of history and violence just waiting to break all over you if you’re standing in the wrong spot. The characterisation is interesting, rather than remarkable – beginning with what look like archetypes, the longer we spend in the company of these characters, the more rounded and real they become, and the less like placards for a message of moral obligation towards the less fortunate. because the country’s problems are the fault of the persecuted, The Peterloo Massacre can stand, if you want it to, as a reminder of the very beginnings of a movement by which the idea of being societally nice to one another was born, a movement which said that child labour was wrong and female suffrage was right, a movement that fought for equality of opportunity, equality of rights to treatment, fairness of wages and fairness of rest. In a world where such things, which became cornerstones of a proud society, are under threat, it stands as a reminder of people who died marching for loaves and votes and the right to be more than a means of production. The Peterloo Massacre is all that, but at its heart, it never forgets that it also has a mission to be two hours of rollercoaster Who, set in a world where the inevitability of history is the Big Bad, and the mean spirits of human beings are the chief motivators of action. Listen to this rapid couple of hours of character-rich Who today, and welcome another Paul Magrs classic into your collection.